Founder of the Institute for the Excellence in Writing Andrew Pudewa has been a big believer in my work for years. He shares his journey through speech and debate in his foreword, and I’m proud to say he’s relied on my resources. We have graduated five of our seven children with two at home, ages 12 and 15, the perfect ages for speech and debate. My wife and I seek to finish our parenting race in the coming years, but we still face our challenges and doubts like any educator does, no matter how seasoned. As I pen this foreword for my friend Chris Jeub, it is the beginning of the competitive season for us, and I’m feeling my youthful self again. I’d like to discuss the value of a formal public speaking program, and the truly remarkable culture of competitive forensics. 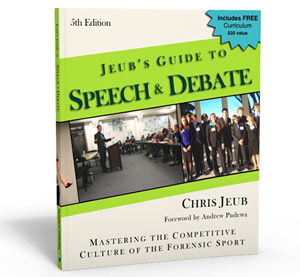 Chris is in the middle of this essential, foundational discipline, and I hope my story will help encourage you to take the precepts in Jeub’s Guide to Speech & Debate seriously. Eight years ago, living in California, my Daughter #3 was 16 and coming into her home stretch. As she had become so proficient at arguing during her childhood, I thought she might do well in a formal setting, where argumentation was more structured and polite. Having met many debaters in my travels, I was always impressed with their poise and confident articulation and really felt it necessary to provide that opportunity for my daughter in the short time remaining. Unfortunately, the closest debate club was 90 miles away, which was just not practical for us at that time. However, I was unwilling to give up the idea entirely, and so with another family who was equally enthusiastic about the idea of debate for their two eldest, we started a club in our local area. Of course, we had almost no clue what we were doing. We ordered up some books from Chris Jeub’s website, got our little group of teenagers together, and started from the very beginning, learning the basics of debate format, collecting evidence, and building cases. The learning curve was steep. Using Chris’ resources and direction, we were ready enough to venture out to our first tournament in San Diego. If you have never been to a speech and debate tournament before, I will tell you point-blank you are missing one of the greatest, most inspiring, truly awesome things happening on the planet. Imagine a hundred or more students professionally dressed, profoundly excited about standing in front of peers and judges, arguing for changes in medical malpractice law in an articulate and knowledgeable way, while practicing in between debate rounds persuasive or dramatic speeches for competition. Now, I must confess I am somewhat of a pessimist by nature and often find the world situation somewhat bleak, but going to that first tournament actually gave me hope for our world in a way I had never before experienced. I saw and heard these young men and women preparing themselves with the writing, speaking, teamwork, and leadership skills so desperately needed in our world today—they were in many ways demonstrating the best of the educational world as I knew it. I was profoundly inspired. Of course, our two teams got slaughtered. They maybe won a single round, but oddly they weren’t discouraged. If anything, they were more enthusiastic than ever to get back to work, gather and organize evidence, refine their cases, study vocabulary specific to the resolution, and practice delivery skills. We went to a few more tournaments that year, and although none had much of a win-loss record to show, all of them enjoyed the challenge and acknowledged the value of the effort they put into it. We were hooked. The next year we got serious, starting in August with a “Speech Boot Camp,” a two-week public speaking intensive, designed to help new students pass their initial resistance to public speaking and get used to writing, delivering, and critiquing several types of speeches. Our little camp was such a help that we created a DVD package we titled with the same name that we sell on our website to this day (www.IEW.com/SBC-D). Although three of our four original students graduated and went off to college, we talked it up and recruited enough new students to double our size; “The Liber” (our club name) had eight debaters, including my Daughter #4. It was a much better year, as we had a degree of experience under our belt and knew what to expect. By the following year, our club had doubled in size again; several of the second-year debaters planned to give platform or interpretive speeches; and we were encouraged to see tremendous growth in confidence and skills in all of the students, especially those who had been so shy and anxious in the beginning. While it’s inspiring and satisfying to see so many young people develop their communication skills through speech and debate, what’s even more exciting for me is to see how the community so actively nurtures character development. With a wide age range of debaters (12 to 18), it is not at all uncommon to see a little 12-year-old girl cross-examining a six-foot 17-year-old boy, or vice versa. The supportive, gracious interaction between students of all ages and levels of experience demonstrates that the forensic world is truly one of social excellence. Will debate take time? Yes, possibly a lot. Money? Yes, some, especially for travel. Will it be worth it? Absolutely. I am confident that if you were to ask a hundred graduates who did debate, “What were the most important or valuable things you did during your teen years?” they would overwhelmingly affirm that speech and debate was the most beneficial and formative, even—or perhaps especially—the ones who resisted the idea at first. My kids certainly would. That’s my story, and Chris Jeub’s work has been a tremendous influence throughout our journey. If tournaments are the most exciting thing happening on the planet, Chris Jeub is in the middle of that excitement. 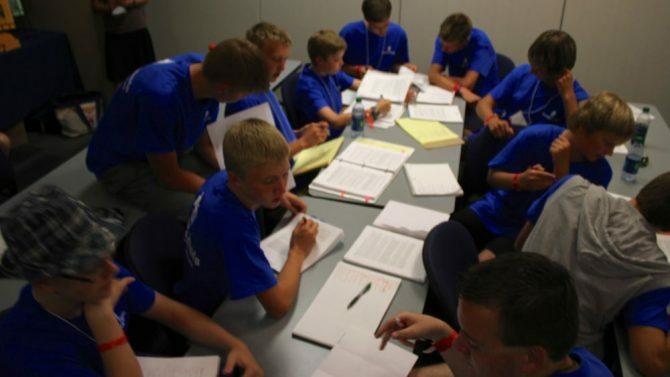 We have sent several of our students to his Training Minds Camps over the years as well as loyally ordering the Blue Book every year it comes out. I have been consistently impressed with his tireless contributions to the speech and debate community. So impressed, in fact, that last year I hired his group to come to our home in Oklahoma and train my club for a mini-camp. My club feels more prepared than ever thanks to Chris Jeub and his team of Training Minds coaches. As I stated at the onset, speech and debate makes me feel young again. We have our late-winter and spring schedule outlined with tournaments in our region. Our family and community look forward to this time of the year. I wish the same enthusiasm for you, your school, your home and your community.